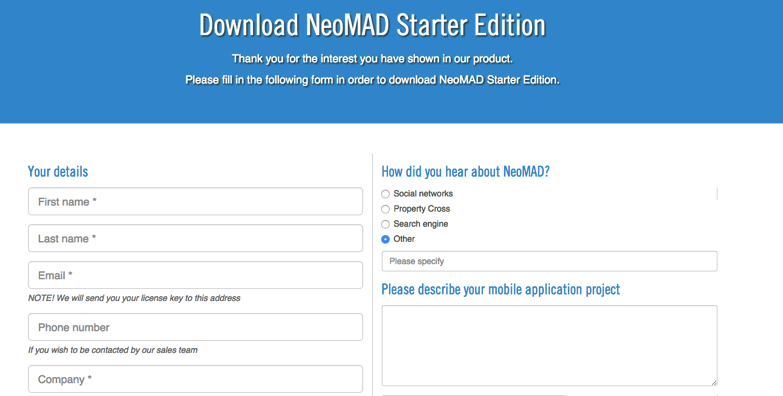 A free Starter version of NeoMAD can be downloaded directly from the website. If you want a full commercial version of NeoMAD, please contact-us. This free version only includes Android and iOS targets. For more options and functionalities refer to the pricing page. You then have the option to download either NeoMAD Bundle or NeoMAD SDK. Eclipse Bundle provides everything you need to start developing NeoMAD Cross-Platform apps including the IDE (Eclipse) and the NeoMAD SDK and plugins. We strongly recommend to choose Eclipse Bundle if you start learning NeoMAD. NeoMAD SDK If you prefer to use a different IDE or run the tools from the command line or with build scripts, you can download the stand-alone NeoMAD SDK. 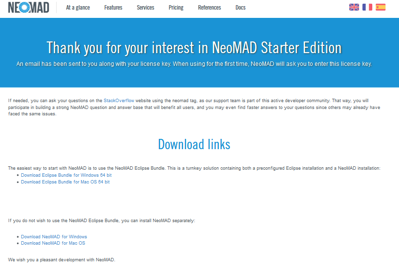 In this guide we explain how to use NeoMAD Eclipse Bundle. Make sure to download the appropriate Eclipse Bundle (Windows/Mac OS) depending your OS version.